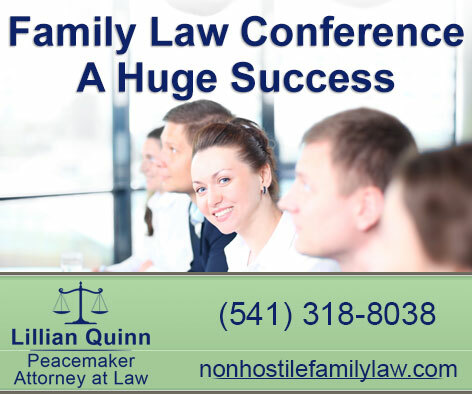 Our annual family law conference held recently at the Sun River Resort was a huge success. Judge Ashby gave a talk on the informal hearings that people in Deschutes County can use. There was an announcement that the option of informal hearings will go state wide in the future. This is an opportunity for people who just have a few issues to be heard in Court. The Judge is the only one who questions and only Mother and Father can appear at the hearing. Each party can submit whatever exhibits they want the Judge to see. No rules of evidence apply and normally the Judge rules from the Bench. I have done a few of these and the attorney can give a brief opening and closing but may not question the parties. I have helped organize exhibits and prepared my client. One case involved the selling of the family home, the timing and cost and whether it needs to be done. We tried the case in the informal hearing and the Judge questioned both Husband and Wife and we had submitted a letter from the Realtor we wanted to use. The Judge heard from both parties and then ruled from the bench. It was quick to get into Court and get this issue heard and resolved. I am thrilled that informal hearings will be available in other counties in our state. It is yet another avenue for people to be heard in family law cases and get resolution. It is certainly cost effective because the attorney doesn’t have to prepare for a 4 day trial and call a bunch of witnesses and experts. Not every case is appropriate for the informal hearing and I would encourage you to speak with your family law attorney if you have questions. The conference had several other good speakers and as always, I learned a lot. It is amazing to me how much there is to learn and I have been a lawyer with 25 years’ experience and am still learning. One of my favorite talks at the conference is at the end when a Court of Appeals Judge gives an update of the family law cases heard the las t year and how the law may have changed. We heard that a beloved family law attorney, Larry Gorin, had died. All of us across the state were saddened. Larry was a wonderful family law attorney and he was a tremendous mentor to all attorneys. He will be missed. Thanksgiving is around the corner and I hope that even in the midst of divorce or separation that you take time out to be thankful. Often there is a silver lining to divorce, you find strength you didn’t know you had, you grow closer to your children, and you start a brand new chapter. There is always something to be thankful for no matter what. I wish you a “collaborative” happy holiday season!